YIKES!!! It's been over two weeks since my last post. Sorry about that guys - I make no excuses - the truth is I've been lazy, and just haven't been bothered to add anything here. 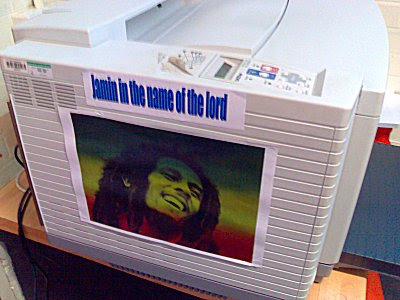 A picture of Bob Marley and the words "JAMIN IN THE NAME OF THE LORD"
Speaking of Evesham High, it looks like I will be getting my 'informal' interview for Network Manager at the school very shortly as the Headmaster mentioned to me that he wants that done before the May half-term holiday. YIPPEEE. Speaking to some people at the school, it looks like the job is 100% mine. Well, not much has really happened over the past 2 weeks since my last post. Oh, our television has packed up, so that has gone in for repairs. Actually, I'm hoping the guy won't be able to fix it as I've got my eye on a nice 42" LCD television. We are having to put up with some cheapo Hitachi 32" CRT which is crap as a backup but it does keep Kieran happy so that he can watch his Thomas The Tank Engine and Bob The Builder DVD's. The weather has been glorious these past few days, so I have been enjoying the countryside that Evesham offers by going for some nice long walks. I've taken loads of nice scenic photos and panoramas too - expect to see some of them on my Panoramic website soon. Now, I've heard of Snakes on a Plane, but I had never heard of Zombies on a Plane, until today! 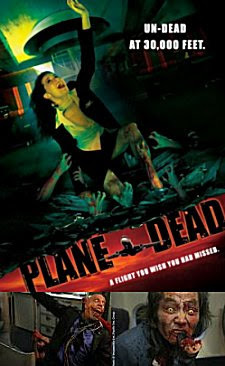 I've just finished watching a movie called "Plane Dead", and I must say I was quite impressed. Its all about a passenger aeroplane that suffers an outbreak of the undead! Now, if you can ignore the rather dodgy acting in some places, and the fact that not one zombie-bound gun bullet ruptures the hull causing catastrophic decompression, and lots of other little plot holes (some really obvious, and some not), then you'll love it. I won't ruin the story by telling you what happens, but if you are like me and love your zombie movies, go and watch it. 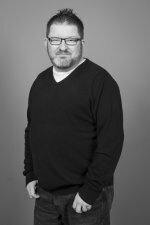 Best bit - The brilliant and funny Kevin J.O'Connor (The Mummy, Deep Rising) being bitten by an old granny zombie with no teeth - "I'm being gummed to death"
What a fantastic week in music it has been with two fantastic releases which I have got to mention here on the Captains-Blog. Anyone who has walked past our house during the past few days have probably heard me blasting this song through our sound system over and over again - Jean Michel Jarre's "Tèo and Tèa" - a fantastic dance track from the album of the same name. Although I'm more of a fan of his earlier stuff (Equinox, Oxygene, Rendezvous, etc. ), this album is still great to listen to and is definatly the best one since Chronologie. And while I am recommending music, Erasure's new single "I Could Fall In Love With You" was released on Monday, and although I don't expect it to do well in the charts (mainly because Erasure are no longer considered 'cool' even though they are miles better than the majority of the crap bands filling up the charts these days), it is definatly a fantastic song, feeling much more like earlier Erasure material rather than the recent Other Peoples Songs and Nightbird (even though they were both good albums). Check out the alternative video, put together by fans at the Official Erasure Website, apparently due to technical problems which resulted in the official video not being finished in time. Due to the popularity of my "Not Another Comic Bakery Remix" featured on Youtube, and thanks to the many positive messages and emails that I have received regarding it, I have decided to do a follow up video to another C64 remix that I literally only finished writing yesterday. The song is called "Noisy Pillars", and is a song I've remixed before in the past (although this version is far superior). Just to wet (whet) your appetite, I have decided to upload a very short video of the intro to the new video. You can view it by clicking the link below. Yikes!! Where has the time gone?? I apologise for the lack of any updates over the past 2 weeks, but things have been pretty busy, and its so nice to be able to finally relax, what with it being the Easter holidays. 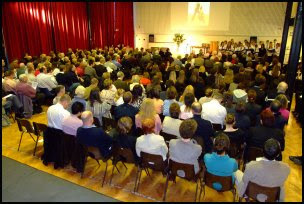 Most of last week was spent preparing for the Annual "Awards Evening" at my school which took place on Wednesday evening. Initially I was responsible for the all the IT requirements for the event , but I ended up being in charge of the sound, managing the stage lighting, technical support, photographer and video recording person!!! (I even ended up having to help finish someones powerpoint presentation as they had a big speech to do). All in all, a very successful evening, even though I started work at 8.00am and didn't leave until 10.30pm! - I love overtime. Right, I'm off now to finish painting our front garden fence.... So long for now!